In the 1840’s American settlers were pushing their way deeper into Arizona and New Mexico. Gold strikes brought eager prospectors. At first the Apache were not openly hostile. 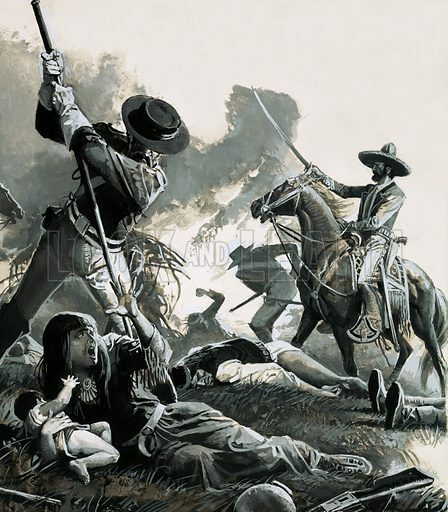 They hated the Spaniards and despised the Mexicans, but they approached the newcomers with curiosity. One group of miners, annoyed and suspicious of the Indians that persistently hung around their camp, seized one of them and, tying him to the back of a wagon, lashed him and drove him from the camp. It was a warning to other Apaches to keep away. It was a stupid act and it had terrifying repercussions. Their victim was Mangus Colorado, a Chief of the Mimbrenos Apaches, and related by marriage to Chiefs of the Chiricahua and White Mountain Bands. For the rest of his life Mangus Colorado made war. Mexicans, Spaniards, Americans – it mattered little. All white men were his enemies. Soldiers were moved into the Southwest and relations with the Apache grew worse. Americans hanged Apaches in retaliation for their raids and Apaches tortured Americans in retaliation for the hangings. In 1861 the United States was torn apart by Civil War. The garrisons of the Southwest were recalled and the Apaches rampaged through the settlements, driving out the settlers and destroying the homesteads. Mangus Colorado and Cochise of the Chiricahuas swept the territory clean and sent refugees flocking into Tucson. Soon even Tucson was reduced to a mere 200 inhabitants. In 1862 General James H. Carleton marched up from California with 3,000 volunteers to restore order in the Southwest. He launched a campaign of Apache extermination. Miners and settlers were encouraged to return to Arizona and were offered rewards for Apache-killing expeditions. Bounty money was offered for Apache scalps. Invitations to “talk treaty” were sent out and, when accepted, the Apaches were shot down on arrival. Mangus Colorado was one of the first victims to be taken in by the treaty offers and was shot in 1863 allegedly “trying to escape.” In spite of this ferocious campaign General Carleton failed to conquer the Apache. They were merely pushed further and further into their inaccessible mountain hideouts and driven to still greater acts of savagery. The war dragged on and by 1871 had cost the United States Government over 40 million dollars and 1,000 lives. It had accomplished nothing. In February, 1871, the Arivaipa Apaches, 150 strong, came into Camp Grant. Their leader, Eskiminzin said that his people were tired. Weary of war, they wanted to live in peace. They were given a strip of land not far from Tucson. On April 28th, a mob of settlers, marched out of Tucson and launched a surprise attack on the unwary Indians. 108 men and women were killed and 29 children taken and sold into slavery. The massacre caused a national outcry. 100 men who took part in the attack were arrested and tried. They were declared not guilty by the jury. An anxious Government sent General George Crook to Arizona. Crook was a skilled Indian fighter but also a humane man. He sympathised with the red man and his policy was one of conciliation. By 1874 all important bands had been won over or rounded up. The Apache gave up the war path and settled on the reservations. The Southwest breathed a sigh of relief. The Indians tried to settle down to Agency life. They planted crops only to see them fail in the barren soil. Their cattle scrabbled for what little vegetation could be found. Most white Indian Agents swindled the Indians out of supplies and made money by selling reservation lands. The women and children grew hungry while the warriors drifted into apathy and drunkenness. The outcome was inevitable. One by one various bands left the reservations and ran wild along the border country. Tales of horror filled the newspapers and terrified the settlers. The notorious Geronimo hung victims head-downwards over a slow fire. Weary troops pursued their elusive enemy. Cavalry found themselves turned into infantry as the Apaches melted into the rocky crags and maze of canyons. Without Apache scouts to guide them, the U.S. Army would have never got within miles of their enemies. It was not until 1886 that the last Apache warriors finally surrendered to General Nelson A. Miles. They were packed off with their families to an unhealthy Florida prison camp. In 1894 they were sent west to what is now Oklahoma. There, and in New Mexico, where some were allowed to go in 1907, their descendants live.